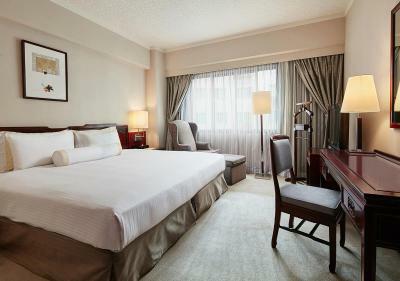 Lock in a great price for The Howard Plaza Hotel Taipei – rated 8.2 by recent guests! I like the convenience of the location. A few minute walk led to one of the major shopping area. Nothing I like in this hotel. Room is very small not enough lighting. Bed is lousy. Middle of the night can hear people knocking. Is it because I booked thru online? That they give small lousy room? The lousiest hotel I have stay. Howard Plaza is at a very good location with a lot of restaurants and shops close by. It is only a short walk to the metro station. It provides plenty of choices for food, including many choices just for breakfast alone. Staff was very friendly. Rooms were spacious. We actually enjoyed the daily breakfasts at the Howard Plaza. The staff was very helpful with our arrangement of Circle Taiwan tour and Taipei tour. All in all a very pleasant stay. Have stayed at The Howard a couple of times and it has maintained its quality of service. Good buffet choices. 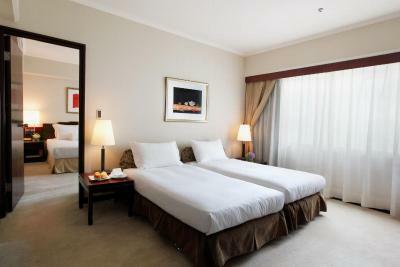 Firm bed, clean rooms and well trained staff. Good locality as just 10 mins walk to two MRT station. Transportation from and to airport is easy to take bus. Very good location, proximity to a lot of restaurants and shops. Friendly staffs. Only a short walk to the metro station. The location was very good. It is a short walk from the metro station. There are plenty of shops and restaurants nearby. We upgraded our room to a deluxe room and it was very roomy. 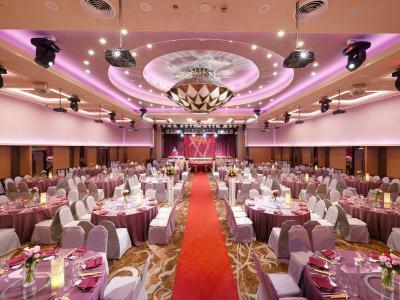 Perfect managment and services provided to our weekend function in the hotel, including refreshment, food, buffet, GM cocktail in our honor. 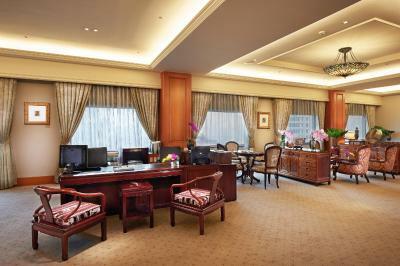 Rooms, lounge, conference room, wifi - everything on the highest standard. 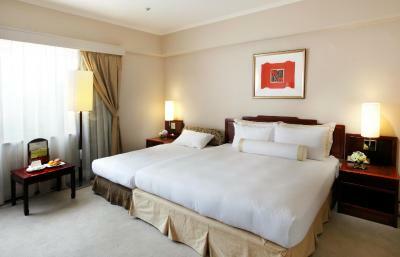 Location in the center of Taipei, easy conections by MRT and airport bus. 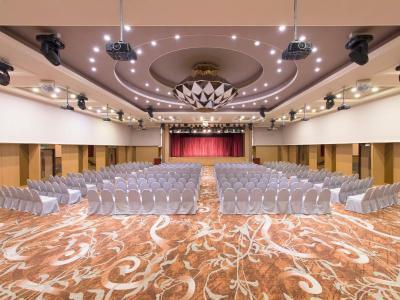 The Howard Plaza Hotel Taipei This rating is a reflection of how the property compares to the industry standard when it comes to price, facilities and services available. It's based on a self-evaluation by the property. Use this rating to help choose your stay! 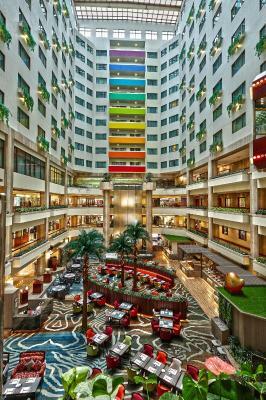 One of our top picks in Taipei.The Howard Plaza Hotel Taipei is a luxurious 5-star hotel is a 7-minute walk from Zhongxiao Fuxing Station. It features an outdoor pool, sauna facilities and free parking on site. 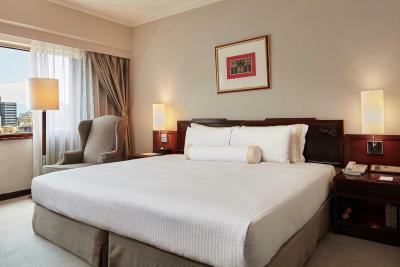 Guest rooms have modern interiors and are equipped with a minibar, tea/coffee making facilities and a flat-screen TV. The private bathroom comes with toiletries and a bathtub. Guests can work out at the fitness center or at the aerobic studio. There is also a shopping arcade within the hotel. The tour desk can assist with making travel arrangements. Featuring the views of the greenery along Ren Ai Boulevard, the Rosewood Restaurant serves French cuisine. 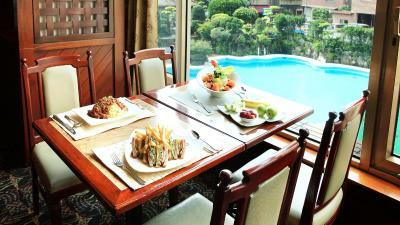 Authentic Shanghai food can be enjoyed at Yangtse River Restaurant. Rainbow Terrace offers a variety of Asian and Western dishes. Chiang Kai-Shek Memorial Hall is a 10-minute drive from Taipei Howard Plaza Hotel. 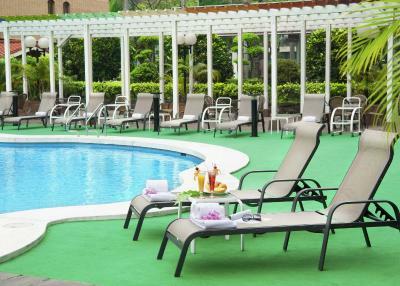 It is a 15-minute drive from Shihlin Night Market and a 45-minute drive from Taoyuan Airport. 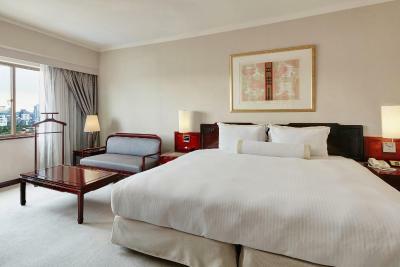 When would you like to stay at The Howard Plaza Hotel Taipei? 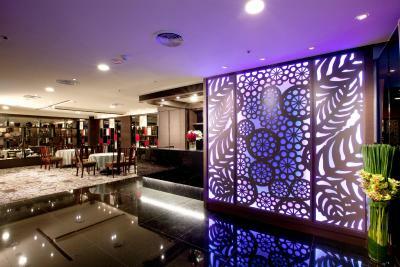 Providing views of the atrium, rooms are equipped with a minibar, tea/coffee making amenities, TV and private bathroom. 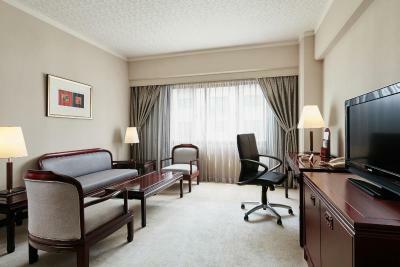 Rooms provide city views and are equipped with a minibar, tea/coffee making amenities, TV and private bathroom. Spacious suite with separate living room and bedroom. Guests enjoy free internet and breakfast. 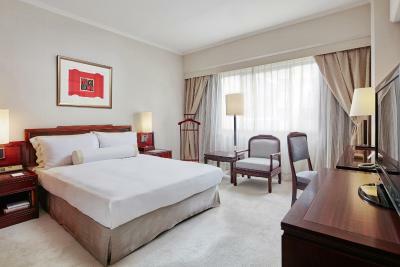 With additional space, these rooms are equipped with a minibar, tea/coffee making facilities, TV and private bathroom. Large rooms are equipped with a minibar, tea/coffee making facilities, TV and have a private bathroom. This quadruple room has a mini-bar and electric kettle. Room has a double bed and 2 extra beds. Hotel surroundings – This neighborhood is a great choice for travelers interested in gourmet food, food and friendly locals – Check location Great location - show map Guests loved walking around the neighborhood! 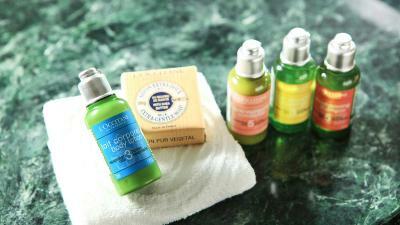 House Rules The Howard Plaza Hotel Taipei takes special requests – add in the next step! The Howard Plaza Hotel Taipei accepts these cards and reserves the right to temporarily hold an amount prior to arrival. The breakfast area was cold and there was tons of flies literally swarming around the bakery area each day - to the point I skipped breakfast on day 2 and avoided the bakery on day 3. Breakfast lacked choice in general. The restaurant area was rather cold and unwelcoming in general Internet was really slow until I made a comment and they then increased bandwidth immediately. The best bed I've ever had in a hotel so I slept well each night! The shower was also great - loads of hot water. The lighting in the bedroom was perfect - nice and cosy atmosphere in the room at night and desk well lit for working when needed. We had to pay a ridiculous price for an Apple. The room was a right squeeze. Wine was very expensive. Chinese breakfast should be mixed together with Asian. The welcome drink was for only 2 people and there was 5 of us. Wine not included. Do not put down to those clients who booked thru online. I saw other rooms are bigger but ours is Very Small. I got sick coz Can’t sleep at night. Can hear knocking of door for 2 nights. I have to fixed the room curtain myself. So easy to fix but can not understand why room service did not do it. Lights from the central hotel get into the room while sleeping. Pool closed off season. Would like a heated indoor pool for off season. Excellent food and service with a smile.